One decade after the first sequencing of the human genome, a recently published book deals with the questions of meaning, value and justice posed by genomic research. Jenny Reardon, UC Santa Cruz Professor of Sociology and Director of the Science & Justice Research Center was interviewed by Isabelle Bartram at The Gene-Ethical Network. While the original interview appeared in German, below is the translated article. What does the title of your book, The Postgenomic Condition refer to? human genome, we had all that data, the 3 billion nucleotides, but it was very difficult to make anything out of it that was meaningful for people. The promise was to reveal deep things about what it means to be human and to provide us with new medical treatments. So far this promise has not been fulfilled. This problem is what I try to kind of call out. 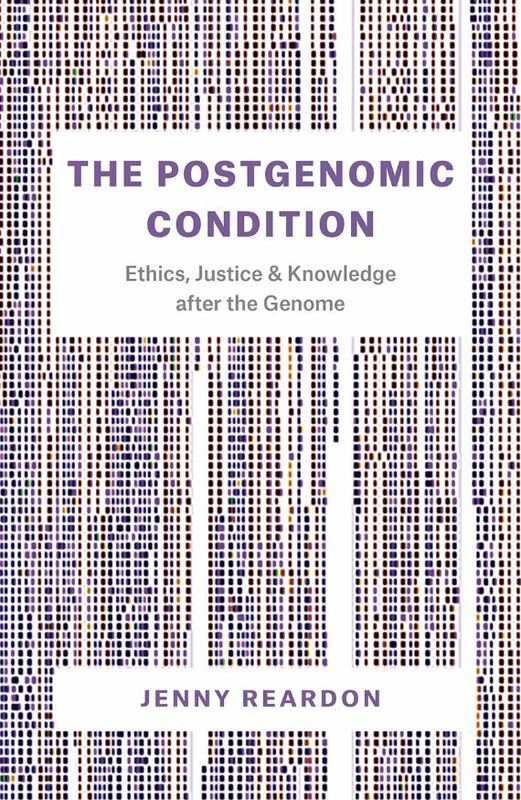 The “Postgenomic Condition” is a kind of riff on the fact that it is a decade after the sequencing of the human genome, but also on Hannah Arendt's “The Human Condition and Jean-François Lyotard’s “Postmodern Condition”. Both wrote about the problem of meaning posed by science and technology. Lyotard was concerned with what happened when mainframe computers arose and a lot of thinking started to be done by machines, which could be easily automated and also commodified. This of course is what genomics has done to biology where now most of the work is done through sequencing technology and machine learning. In what way is genomics and big data health research a justice issue? I think we are living in a moment like that where people are questioning the authority of fundamental institutions. There is declining credibility of the state, banks, universities – people are saying that these institutions have lost their vision. However, while the world is increasingly seen as unjust, the one thing that society is perhaps still willing to believe in is science and technology, particularly the information sciences. People believed in the original utopia that through informatics, through the Internet we would be able to build and rebuild the world and put people at the center. A believe that was fostered for example by the early story we had about the Arab spring, where Facebook and Twitter played a positive role. However, we know from the recent appearance of Facebook’s Mark Zuckerberg on Capitol Hill that our governments increasingly have no political will to challenge powerful data companies. In the end these companies have shifted from being the democratic utopia we had hoped for, to being oligarchs that themselves raise questions of justice. So the issue of justice is the fundamental question of how we are going to live together today in a moment where data has become the ruling currency in which we live our lives. And genomics is a part of that issue when data needs our own bodies. In the beginning of the genomic era, there were huge promises made about the power of genomics and how it would change everything. So far not much has been achieved. Why has there been no “biomedical revolution” yet? I think the reason is the failure of the approach of saying “we are doing the science first and see about the social implications later”. You really can't do that because you are designing in - whether you want to acknowledge it or not - certain uses for things and certain meanings as you do it. At a certain point in the history of sequencing the human genome the decision was made to only sequence. We build up a technical infrastructure that was very savvy at producing a lot of data but didn't have a clue on how to interpret it. Now that we have a whole system that is build on that, it is not surprising that it is very hard to interpret the data so that it means anything. To really bring benefit it would require a totally different, institutionalized form of genomics. That would include integrating social and political analysis into it, and finding a way to evaluate whether or not the outcomes of the research are benefitting people. Do you think people noticing the current gap between the promises and the reality of genomic research? Yes, I think so. For example on 3rd street in San Francisco, where I have spent the years living while I was writing the book, there has been a massive buildup of shiny buildings I have been calling "Biotech Disneyland". In a research project of the Science & Justice Research Center we looked at 3rd street, mapping it out as a space, observe how the money is flowing and asking questions about what happened to the community health clinics. When the University of California, San Francisco was going to close the last reproductive health clinic that served black and Latino youth in this region it also caught the attention of the Black Lives Matter (BLM) movement a couple of years ago. BLM raised the question why they could spend billions on 3rd street and then close this clinic that serves the population of the people that live here. So I think it is being noticed by people - but what can we do? I hope the kind of analysis I do in the book can be part of answering this question. “Open science”, “Open data” is often seen as something that can fix a lot of the current problems in science. Where do you see the constraints of these efforts? The HGP has been largely identified with starting the open science movement. A lot the meaning and value of the HGP came from the idea that it had saved the world from the privatization of the genome. However, this is an entirely too simple story. Somebody has to do some labor to make things available and you need resources in order to access them. Just to talk Open Science it is to live in some fairyland world. My colleague Stephen Hilgartner likes to talk about data sharing regimes, because it gets you to think about that there is power and politics involved if you use the term regime. I think openness it is the last remaining liberal value that people really want to get behind. But if it's the only remaining liberal value it has lost its support system. It meant something when you also had a meaningful right to consent, a right of participation and inclusion. However, the DIY bio space is a complicated space - there are also people who are thinking carefully about the political stakes and dimensions of what they are doing, who want to open up science to make different forms of science possible. I support that. But I think we need better terms for describing what we want and I personally don't think “open” should be the term, also not “democratic”, I think we should ban the use of these terms so we could actually speak to one another.